You have discovered THE best quality log furniture, at the best value......GUARANTEED! We create, design, and produce custom handcrafted log furniture, built from the natural resources found in Montana, at prices anyone can afford! "I'm passionate about bringing a little of the outdoors into your home.....with your creativity included!" We are THE Creator of the Log Crib & the Convertible Crib, and are still one of the only Craftsmen Who produces the Convertible Crib!! Check out this short video featuring some of our Unique, Extraordinary Craftsmanship that elevates us above our competition! If you can't find the rustic furniture that you are looking for, please ask. We are a custom builder and can definitely create the EXACT furniture that you are imagining! You will not find better custom, authentic rustic furniture at a better price.......anywhere! 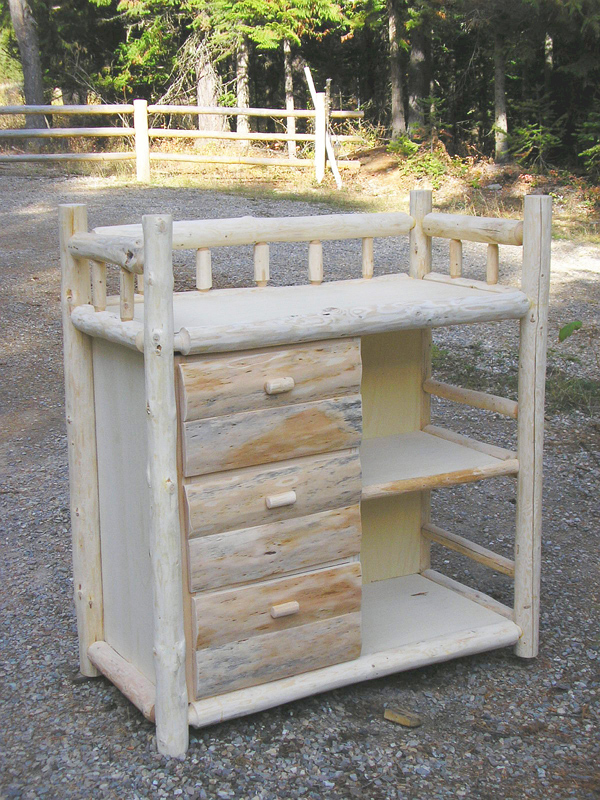 First, we create beautiful, custom, handmade rustic furniture from products and materials found only in Montana. We proudly build our rustic furniture the old-fashioned way-by hand and the sweat of our brow, one order at a time, focusing on quality craftsmanship, impeccable beauty, authenticity, and rugged durability. Second, we produce the most durable, authentic, handcrafted, rustic furniture at prices that are way below our competition. We boast the best value in the marketplace because we maintain an extremely low overhead by keeping our advertising, merchandising, labor, and manufacturing costs at a minimum. When we say handmade it is made with OUR hands in OUR shop on OUR workbenches with OUR tools, not in a factory or assembly line with expensive machinery and equipment. Third, you will participate firsthand, throughout the process, and make every significant decision regarding the design of your new custom furniture. Truly CUSTOM furniture, built specifically for you, to accommodate your precise specifications, personal preferences, individual styles, tastes, and desires! Our ability to work WITH you to create the EXACT log furniture that you're imagining is what separates us from the competition. 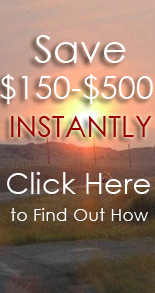 You ALWAYS get the exact items that you are looking for (or cannot find anywhere else), at a price anyone can afford! Please contact us for that extra special project you have always dreamed of. Take advantage of our multiple item discount. The bottom line is this.....the more rustic furniture you need, the better price you receive, and the more money you will save!! Feel free to mix and match, modify, alter, and specify your log furniture ideas. Let us know EXACTLY what you are looking for, and we would love to send you a proposal that you cannot refuse! Check out this Video to Learn more about our Famous Convertible Log Crib! You can learn more about us here. Please check us out, find out why we can offer the best log furniture at the best prices. We want you to be confident and comfortable with your new log furnishings. Please contact us for that extra special project you have always dreamed of. Take advantage of our multiple item discount. The bottom line is this.....the more log furniture you need, the better price you receive, and the more money you will save!! Feel free to mix and match, modify, alter, and specify. Let us know EXACTLY what you are looking for, and we would love to send you a proposal that you cannot refuse! and his heart is an artist." After a long, hard day you deserve to have a sanctuary where you can relax your mind, body and spirit. A bedroom is a personal and private space that we believe should be filled with custom built bedroom furniture that fits the lifestyles and personalities of our customers . 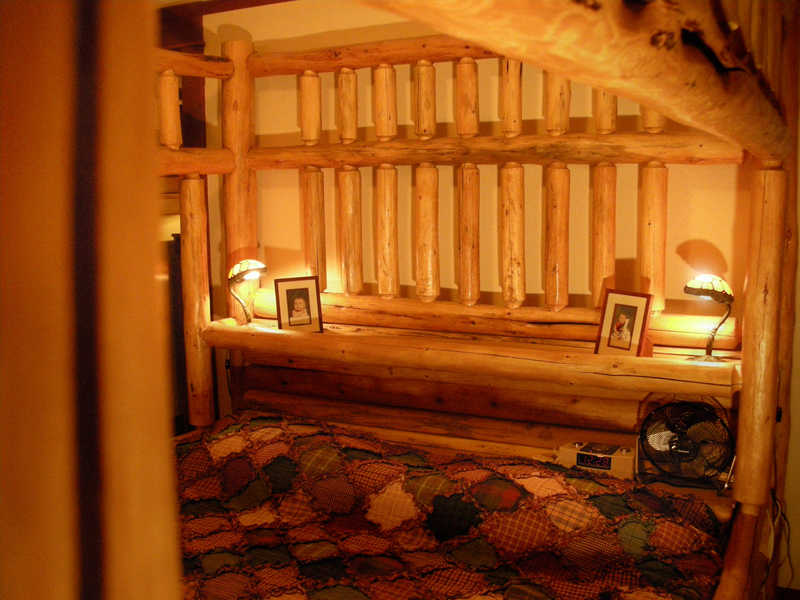 Join us in our rustic log bedroom furniture showroom and become your own creator of custom log furniture today! As your baby grows stronger, our solid wood baby furniture is solid and tough enough to withstand jumping and pulling and playing. 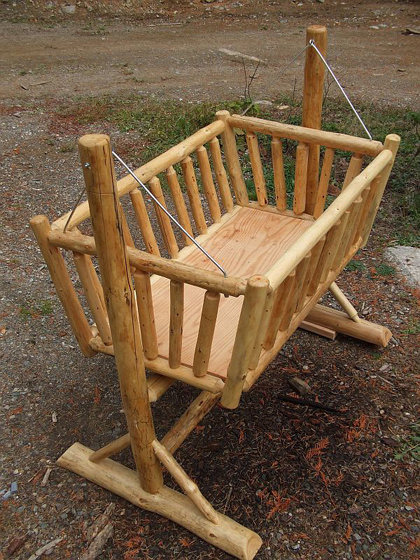 Step into our rustic log nursery furniture showroom and take a look at some of our most popular rustic log nursery furniture and become your own custom designer today! 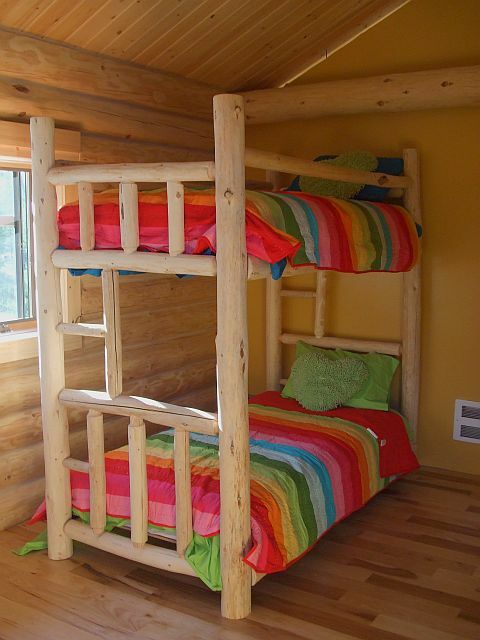 Our log bunk beds are not just for children anymore. 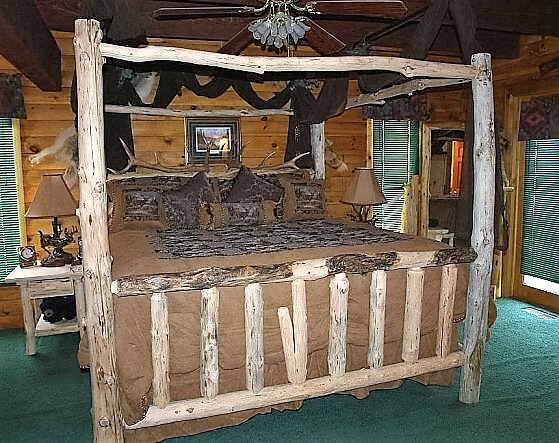 Sturdy, durable, heirloom quality, rugged, and unique rustic furniture is what you can count on receiving when you welcome your log furniture bunkbed into your home, cabin, lodge, or retreat. 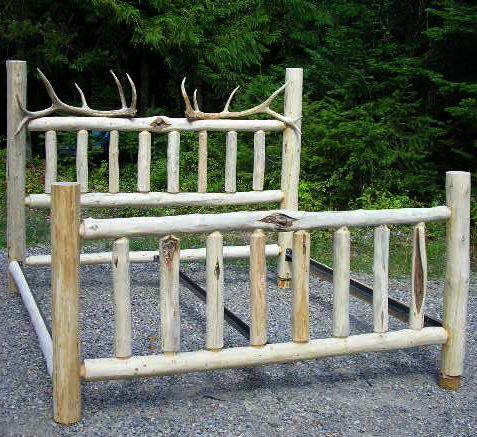 Browse our rustic log bunkbed furniture showroom and help us design your very own handcrafted, custom, rustic log bunkbed today! We search the Montana landscape and hand-pick beautiful lodgepole pine and craft our lovely rustic log living room furniture just for you. Gain insight into what we can create for you by taking a look at our rustic log living room furniture showroom and become your very own furniture designer today! Many of our customers are busy multi-tasking and have found great pleasure in showcasing our rustic log office desks, log computer desks and log student desks, rustic log office chairs, log printer stands or glass and log bookcases. Step into our rustic log office furniture showroom and put your own design skills to work today! We offer an unlimited variety of rustic log swings and porch swings, log picnic tables, log picnic benches and log garden benches, log Adirondack chairs, and our most famous convertible picnic benches. Get your creative juices flowing and take a stroll through our rustic log outdoor furniture showroom today! Our one-of-a-kind custom rustic pet beds are lovely places for your beloved companion to rest their tired head after a long day of play. We handcraft log kitty condos, log scratching posts and rustic log cat litter boxes too. Take a peek inside our rustic log pet product and accessory showroom today! Surprise your little one with a rustic log Rocking Critter, crafted in the shape of a moose, cow, horse, deer, elk, bear or any animal your child loves, or choose one of our rustic log rocking horses, a classic for generations. If you can imainge it —we can create it! Take a tour our rustic log children's toy showroom today! 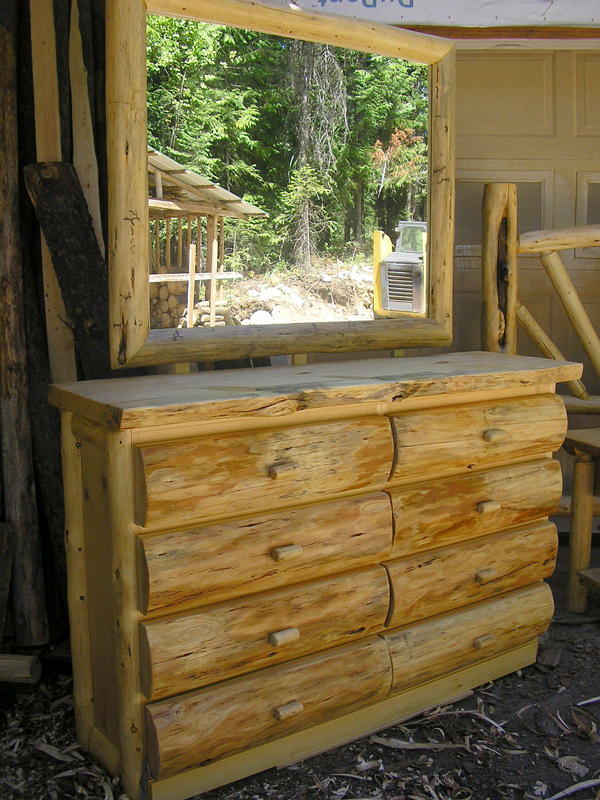 Mother Nature creates her own magnificent beauty, and here at Montana Custom Log Furniture we capture that beauty and craft it into attractive log décor accessories for your home. Step inside our cozy rustic log home decor accessory showroom today! Choose one of our spectacular log dressers that will surely become a family heirloom to be passed on to the next generation. We create specialty rustic log furniture that is breathtaking as well as fully functional. Join us and take time out to view our rustic log dresser and log armoire showroom today! Enjoy dining in any room with one of our handsome log TV trays and never miss your big game again! We can create any type of rustic log accent table that you may be dreaming of. Enjoy looking through our collection of log furniture occasional tables and visit our rustic log accent table showroom today! Show off your newest rifle or beautiful bow and arrow in one of our Log Gun Cabinets or Rustic Gun Racks. Our custom furniture design service puts you in charge and we are happy to handcraft a one-of-a-kind rustic log furniture armory display or storage unit based on your vision, space, style and taste. Be inspired and enjoy looking through our rustic log gun racks and log gun cabinet showroom today!